The Action Group provides a range of services to adults with developmental disabilities in Lacombe, Red Deer and throughout Central Alberta. Services are responsive to the changing needs of participants and can easily be developed through a number of programs. One to one support provided through this program affords participants the opportunity to engage in all that the community has to offer. This might include recreational or social activities, various amenities, spiritual gatherings, board membership or other volunteer opportunities. Support staff assists people to gain access, develop necessary skills and confidence and to foster relationships that can lead to more natural supports in the future. People who live in their own home can receive support and skill development to meet their daily living needs. They may choose to access training to manage monthly finances, plan and cook healthy meals, develop home maintenance routines and problem solve unforeseen challenges. The Approved Home program matches participants looking for support with the kind of home that fits their needs, personality and lifestyle choices. This could be a family, couple or single person. The participant pays room and board and the Approved Home Operator receives remuneration according to the support they are contracted to provide. Participants who own or rent their own home may wish to have a supportive roommate. Whether some one lives with his or her family, or with an Approved Home Operator, they may wish to have a break by spending time in another supportive home. Alternatively, a Respite Provider may provide the support in the person's home while those who usually support are away. The residential program is designed to be flexible and adaptable in order to meet the unique service needs of each individual. The underlying philosophy is to provide participants opportunities to enjoy inclusive lifestyles in natural settings. Staffing supports can be made available up to 24 hours a day through a Person Centred approach. Supports are typically provided in shared living arrangements not exceeding three people. This program is available throughout Central Alberta. 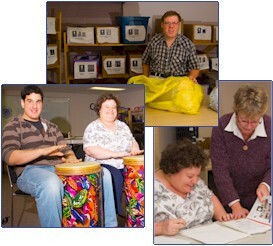 The Outreach Program supports participants who require minimal assistance to maintain independence in the community. In this program, individual support needs should not exceed 15 hours per month. While this service is normally provided to participants living on their own, those residing with family members may also be good candidates for the program. Supports are tailored to meet the specific needs of each individual. The Outreach Program may also provide temporary supports, crisis intervention and liaison services. The employment Program recognizes people's right to build their own lives and promotes the development of potential through a balance of self-determination and accountability. This program specializes in strategies to overcome barriers to employment through a team approach. It supports the needs of both the individual and the employer to ensure a partnership that thrives. Supported job seekers are skilled, enthusiastic, serious, loyal, dependable, motivated, and reliable and take pride in their role. The program offers a full range of services from pre-employment skill development, interest assessments, specialized skill development to career exploration and assistance on the job. This unique program was established in Lacombe in 2001, and in 2005 it expanded to include Red Deer. The program supports people with developmental disabilities to explore their interests and become aware of their community in order to experience the richness of life that is the right of every citizen. Skills are developed which are the foundation for natural community connections and self-advocacy. Activities that address various learning styles allow participants to gain confidence in a supportive group environment to then transfer their skills to community-based opportunities. Relationships develop as participants are instrumental in changing attitudes on a personal level, enhancing the capacity of the community to embrace the diversity of all its members. "Perhaps the first step, then, toward community on a grander scale lies with the acceptance of the fact that we are not, nor can we ever be, all the same."